The Storefront Pricing Tables extension allows you to easily create and insert attractive pricing tables into posts / pages on your Storefront powered web site. Enter the WordPress Customizer to begin using the plugin. There are two main locations where you will interact with this extensions functionality; on the add/edit post screen and in the Customizer. On the former you will insert your pricing tables using the Pricing Table shortcode and in the latter you can customise it’s appearance. You can insert the shortcode by manually typing it and the relevant attributes, or you can use the included Shortcode Generator which is easier. 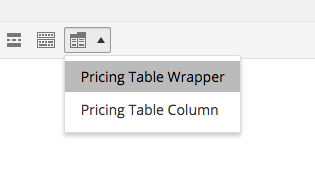 First, add the wrapper by clicking the Pricing Tables button the selecting “Pricing Table Wrapper”. 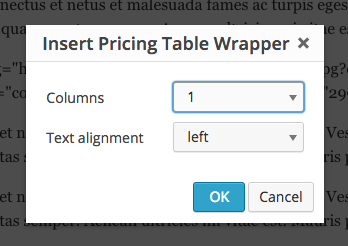 You will then be prompted to declare how many columns your table will have and to specify the content alignment. Choose the appropriate settings then click OK. Step 2 is the add a pricing column. First of all, ensure that your cursor is between the pricing_table shortcode opening and closing tags so that the columns will be inserted within it. Then click the Pricing Tables button and select “Pricing Table Column”. Doing so will open a prompt to enter the content for that column. Product ID: This can be found on the edit product screen and will be used to create the add to cart button at the bottom of the column. Column Title: If you leave this blank, the title of the product specified in the Product ID will be used. Otherwise it will form the content of your column title. Features: The features you want to display in your column. Separate each individual feature with a pipe (|). You can add basic html here. Image: Choose whether or not to display the product image. Highlight: If you check the highlight checkbox, the column will have different styles applied to it giving it visual priority over other columns. It works best if you highlight one column rather than many. Note: The Shortcode Generator will insert the image attribute with a value of true or false, you can however display a custom image by inserting a URL into that attribute instead of true or false. Go ahead and add as many columns as required, but remember that to ensure a consistent layout you should generally have as many columns as you specified in the wrapper shortcode. 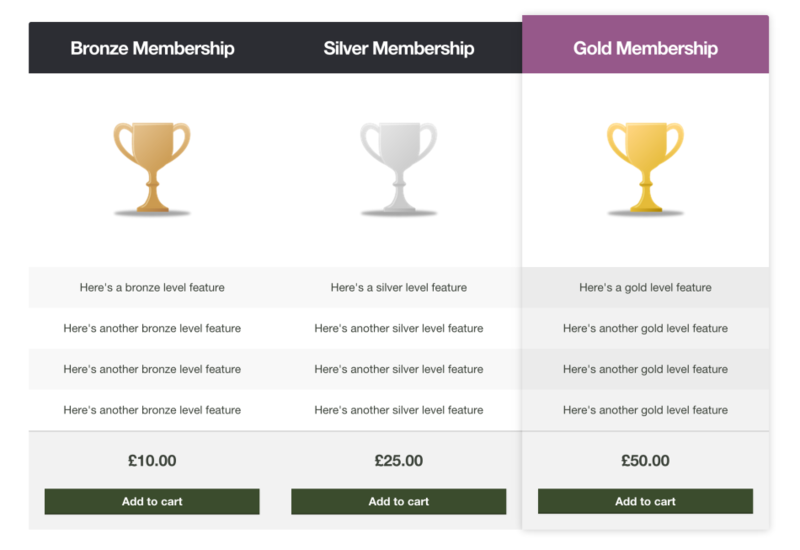 There are two shortcodes used to display the pricing tables, a wrapper shortcode and a column shortcode. Once you’ve added your pricing tables, you can tweak the appearance in the Customizer. You’ll notice a new section titled ‘Pricing Tables’, open it up to reveal the settings. It’s important to note that several of these settings (alignment, columns etc) can also be controlled via the shortcode. If any of these values are present in the shortcode attributes, they will override what is set in the Customizer. Think of the Customizer as a place to set defaults. So as an example, if you specify 3 columns in the Customizer, but 2 columns in the shortcode, that particular instance will be presented in 2 columns. However if you add the pricing_table shortcode and do not specify a columns attribute, it will inherit the setting of 3 that you specified in the Customizer. The settings you’ll most frequently use here are the colors. 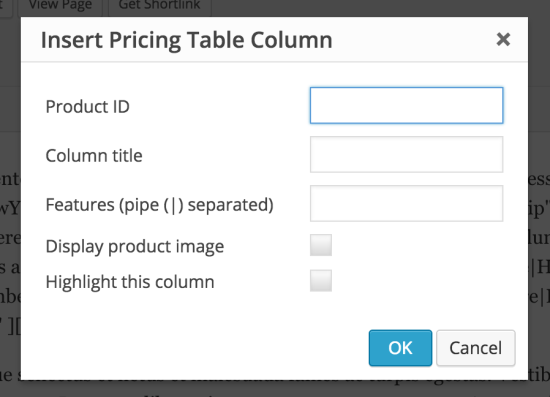 You can change the header background and text colors for standard and featured columns.